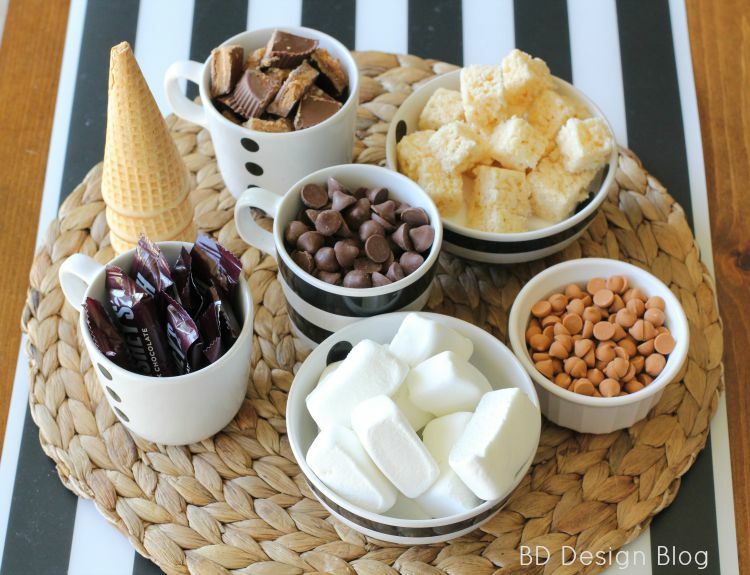 Campfire Cones are a yummy dessert where you can add just about any chocolate-y candy into a sugar ice cream cone and melt it in the fire pit. Campfire Cones bring back childhood memories of when I was a little girl and every Sunday after church we would take off to the mountains for some family time. We would make these treats a lot because they are SO EASY and SO YUMMY! And there was no fighting about what we were having because my brother’s and I got to make our very own! So are you planning a camping trip soon or just having a get together with friends in your back yard? These campfire cones would make such a fun treat! STEP 2: Carefully stuff your sugar cones with your treats. This is where your guest can customize there dessert! I was a fan of the Rice Krispie squares mixed with the peanut butter cup. STEP 3: Wrap the cone in tin foil. You can bake in the oven at 400 degrees for 5 minutes or until the insides are melted. Or if you have a fire pit, you can place it in the fire for 5 minutes as well to melt your chocolate and marshmallows. STEP 4: Unwrap and ENJOY!! Everything is melted and gooey and yummy! Have you ever tried these before? I love that this can be a gluten free option too for my daughter by using a gluten free sugar cone! So HAPPY National S’more’s Day! !